“Supporting Sarah to be the courageous presence she is in the world, gives me deep sense of connection, rightness and delight. The fact that our economic system fails to support the pioneers committed to shaping more beautiful world, only emphasises how broken it is. If we want new kinds of leaders we need new kinds of support – and Sarah’s pioneering adoption programme is exactly that. 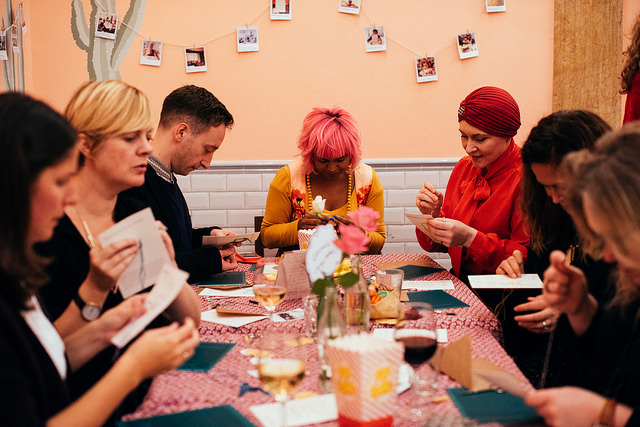 Thank you for considering giving your support to me and the Craftivist Collective. If you #AdoptACraftivist before 28th February 2019 you will receive our exclusive 2018 yearbook as well as each subsequent year – only made for adopters. Shouting, heckling, and hating are not the only forms of political engagement. Leonard Cohen said, “There is a crack in everything, that’s how the light gets in.” My gentle protest approach to craftivism is part of that light, and it is getting in. The reality is that I also need to make the books balance at the end of every month. There’s no big organisation paying a monthly wage here. And being a pretty niche operation means this work doesn’t tick all that many funding boxes. The Craftivist Collective ethical kits are made by me at my humble rented studio apartment (that I love). I pack and deliver every order to my local Post Office with love and excitement dreaming of what that craftivist will be able to do with our kits and tools. 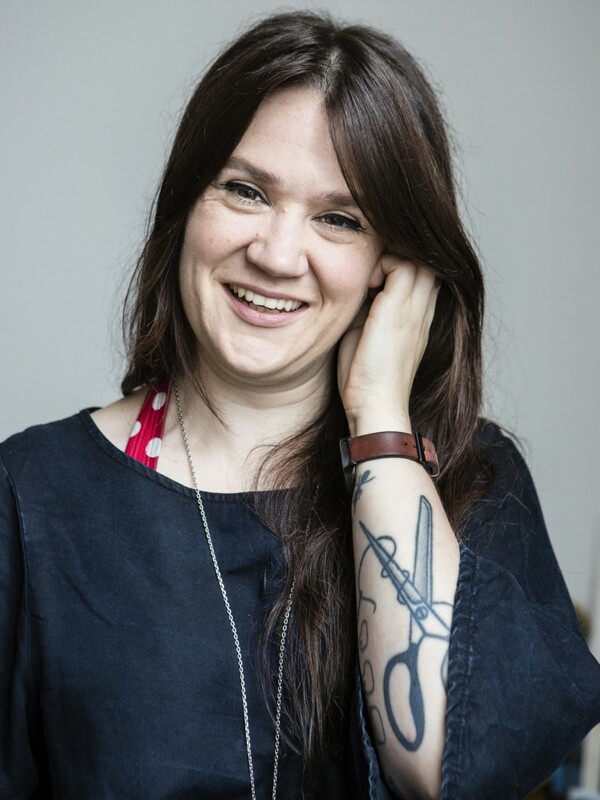 I give lots of talks and workshops, consultancy and collaborations as well as daily strategic advice to new and experienced craftivists online to help them be as effective and loving as possible in their actions. And as you can see on social media – it’s all having wonderful positive ripple effects and people are really open to my questions, comments and constructive feedback. The worrying thing is – there isn’t enough time in each day to keep doing this and take on a full or part time job to pay my small living expenses to keep me living without chronic financial stress. I’m keen to stay independent and stick to my principles when it comes to my work like keeping this website ad-free and turning down offers of paid work that don’t fit with the principles of the collective. But that means I need your help. If you’ve been inspired by the work we do in any way, I’d be so grateful if you’d consider supporting it to continue and grow. By adopting me (not literally – you don’t need to get the spare room ready!) 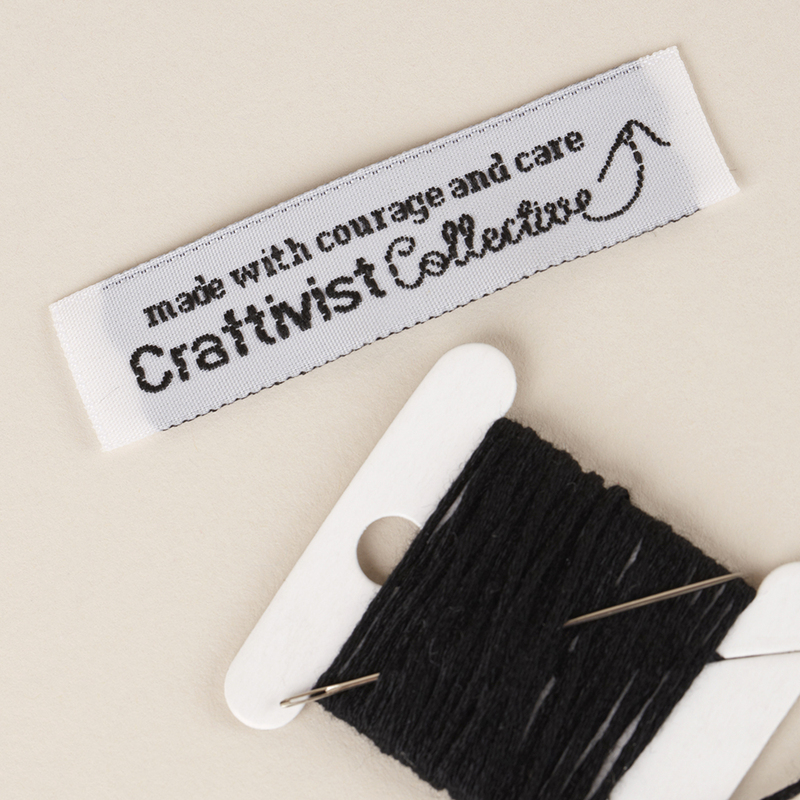 £10 a month for the remaining months of 2018 (or longer) you will help ensure that the Craftivist Collective survives (this can be paid monthly or one lump sum) for another year and hopefully longer. This isn’t a new concept for activists – campaigners throughout history, from Martin Luther King and Gandhi to Peter Tatchell and Jack Monroe, have relied on the kindness of strangers and friends. Now I’m appealing to that same kindness to help keep the Craftivist Collective thriving. We’ve seen many universities across the world include our work in their curriculums. We’ve gone from receiving hostility and ridicule for our approach to activism to gaining worldwide credibility, praise and even an award from the charity sector for our way of campaigning! We’ve gathered over 33,000 followers on social media keen to learn more, be inspired and empowered to be better global citizens in our world. We’ve helped art institutions bring activism to their audiences in a gentle way. “We all know that the work Sarah does is powerful, inspiring and deeply timely. But for me, just as inspiring is the brave way she has chosen to support her work, with her Adopt a Craftivist approach. 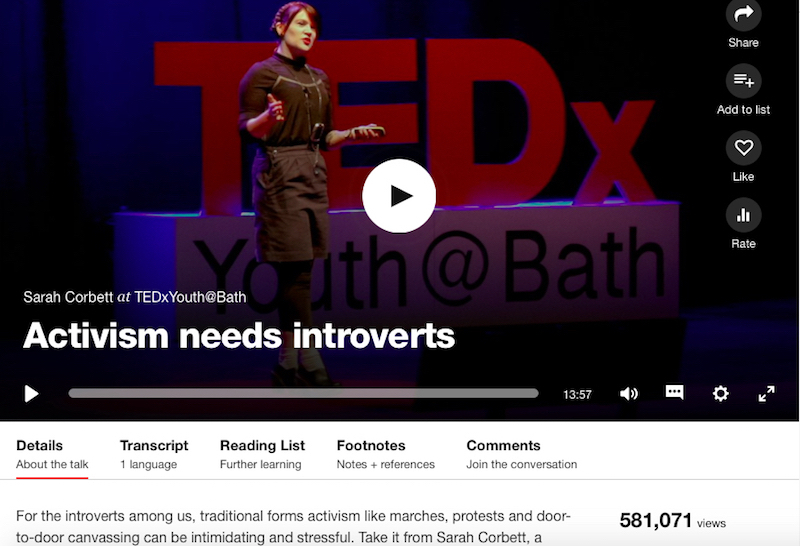 I know from my experience that it takes more than a year to really find your feet as a changemaker, and every day I am deeply impressed by Sarah’s work and what she is achieving. Supporting an inspiring changemaker is one of the most impactful things you can do. Please keep supporting Sarah, she’s amazing! I’m a hard worker but without your adoption I cannot put in the hours and days needed to help support and harness this growing community and help people become part of the change they wish to see in our world. 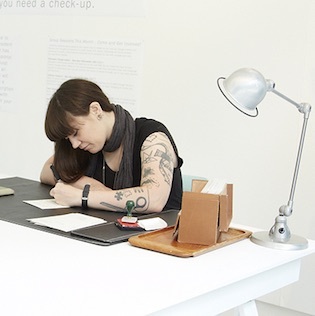 Working with Sarah made a massive difference to our Making For Change Craftivism programme this year. Her talk was a succinct, visual and well delivered insight into her approach to gentle activism which gave the young participants an excellent understanding of the impact craftivism can have. Through the one to one surgeries Sarah gently tested, stretched and challenged the young people’s ideas helping them to create campaigns that were more relevant and refined. “Congratulations on publication of your book. We received our copy and are inspired by your thoughtful writing. I imagine using it as a reference again and again to spark new ideas”. I love what you are doing with craftivism, the activism burnout is real for me at the moment so your workshop came at the perfect time. You will be adopting me, Sarah Corbett. Isn’t there another way of getting funding? Being pretty niche in what we do and focusing on transformation rather than transactions means we do not tick many funding boxes. I could apply for funding that fits the funders objectives but that would dilute or compromise our work. It’s much more sustainable to have individuals cover our core costs. Why not get a part time job? In this line of work I would have to say no to most opportunities that are on offer to deliver creative activism events, projects or teaching since they are all sporadic and could be any day, evening or weekend. It would be incredibly difficult to find a part time job with such flexible hours and have the energy to do both. Is this a thing, you know paying for an activist? Throughout history and still now, individual campaigners and campaign organisations often rely on supporter donations to give them the time and flexibility to focus on creating what they judge to be the impactful work- Pankhurst, Biko, Gandhi were just at one end of a long line of passionate, generous, canny people who saw a cause they felt needed to be fought for and they backed it. Now I’m not promising I will be able to deliver change quite on that scale, but I will promise you that I will fight for change through those most radical of things – creativity, beauty, organisation, love, and truckload of hard graft. Can I GiftAid my payments? The Craftivist Collective is a social enterprise as opposed to a registered charity so GiftAid is not possible. This is because the UK Lobbying Act of 2014 (often called the ‘gagging law’) has limited how much campaigning charities can do and it’s important we are not censored. It’s an American website that takes a percentage of the donation. Can my company sponsor you? Yes and I can send you an invoice if that helps. However as a sponsor you will not have control over content or have your name visible unless all supporters are listed as well. I’m in! 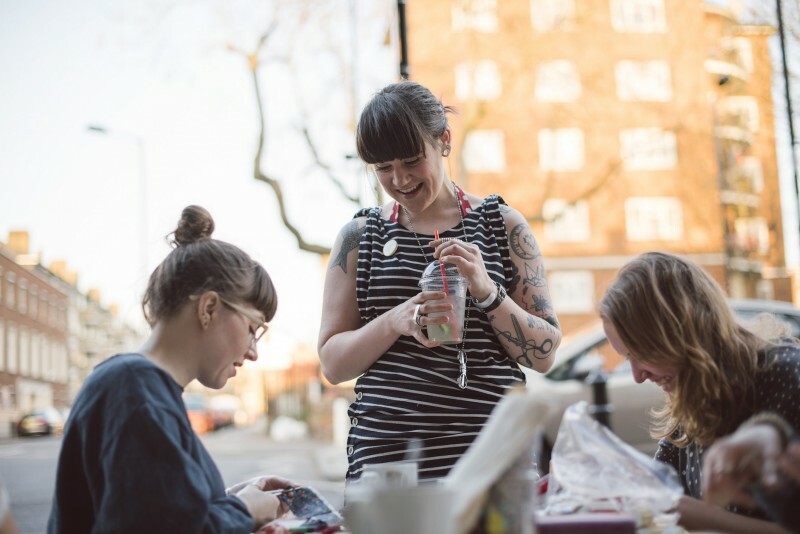 Can’t have Craftivist Collective disappearing – you’re doing far too much important work! Proud to be able to help secure your future. Count me in! Love the Craftivist Collective. Keep up the awesome work! I have only recently become aware of your initiative. I too used to work for Oxfam so a bit of a link there! have signed up for the year’s support. Hope you get the money you need to continue your great work. Happy Christmas! Thanks to Time Out, I’ve just adopted you so hope my support goes someway to help you continue your work. Happy Christmas! Thanks to Time Out, I’ve adopted you so hope my support goes someway to help you continue your work. Have loved being a sponsor in 2017 and hope you will let us know what increase you need for 2018. Congrats on the book launch and please keep up your good work and inspiration. Tina your emotional and financial support means so much and yes it would be a huge help if you could continue to adopt me each month for £10 or more if you can. I’m adopting you because … fonts! Mate – thanks loads you lovely man.